They say that to become a tradition something has to be repeated three years in a row so I guess you could say that Turkey Wellington is my families Christmas tradition. I asked my hubby the other day what he wanted to see on the Christmas lunch table this year and his answer was the same as it has been since I first cooked Christmas lunch for us! I have to admit I would have cooked all of what he suggested anyway without asking him. They are our traditions and Christmas just wouldnt be the same with out them. BREAKFAST- Gingerbread Muffins & Homemade Croissants- I have never made croissants before opting to buy them but I am giving them a go at home this year! 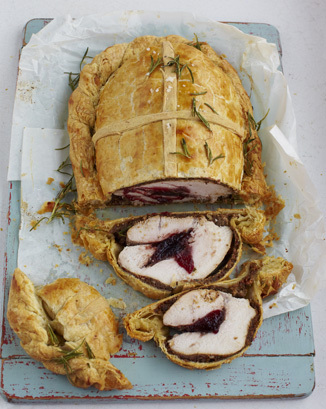 LUNCH- Turkey Wellington- I have always used this Gary Rhodes recipe before but this year I am trying Jamie Oliver's recipe and as you can see from the picture you can see why- how good does that look! Promise I will take a piccy of mine for comparison. Roast Potatoes- I think that if I did not cook Roast Potatoes my hubby may not speak to me for the whole year! Buttered carrots and peas- you have just got to have carrots and peas- FACT! Gingerbread Stuffing- May sound odd but it is amazing, trust Nigella and make it! And to finish the meal off in style we have a festive Baked Alaska! After I set fire to the table one Christmas pouring the firey alcohol over the Christmas pudding I decided it was safer to find another tradition that did not require the Fire Deparment!